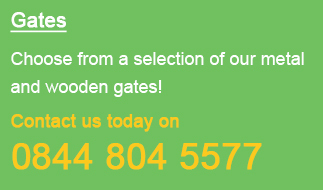 As a market leading supplier of garden gates we take pride in the products we supply. Having worked hard to establish close working relationships with some of the UK`s leading manufacturers we feel our products are second to none in terms of quality, durability and performance and ultimately represent exceptional value for money. However when choosing to buy a garden gate or driveway gates from our website you will need to take into account the material from which it is constructed so you can understand the inherent differences. Loved by many as a natural building material wood is a great thing to work however as it will hold different moisture content at different times of the year therefore it is essential that you understand that it will be subject to movement in the form of expansion and contraction. Untreated softwood gates are constructed from smooth planed kiln dried timber that has a moisture content of around 14% however seasonal fluctuations in the weather can influence the amount of moisture within the timber at any given time therefore we have complied the following checklist to ensure you keep your gates looking as good as new for many years to come. 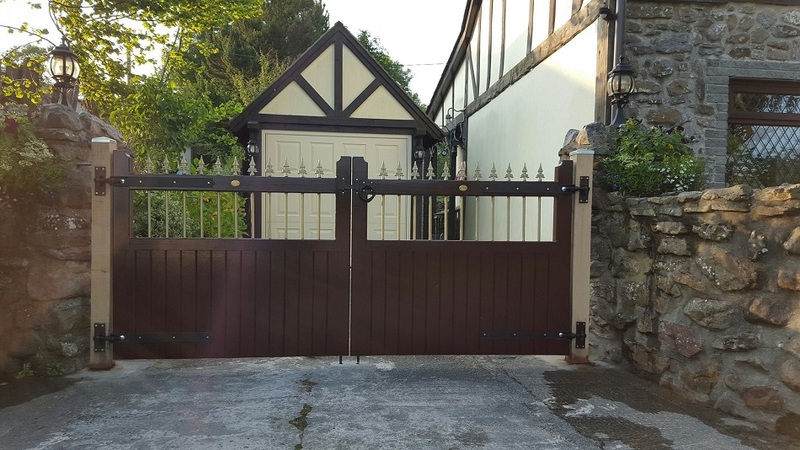 In order to prevent the gates from swelling or getting water stains on them we always recommend they are stored in a dry environment until such time they are to be fitted. Do not lean the gates against a wall as you may find they bow (this is not a manufacturing fault). Instead they should be stored in a horizontal position on timber bearers that support the gates weight (across its full width) in at least 3 -4 places. Before commencing with the installation all the timber surfaces should be stained or painted following the manufactures guidelines. This normally entails a minimum of 2 coats of whatever finish you select. When doing this make sure you pay extra attention to the bottom of the gates as rainwater will splash up from the ground. When fitting the gate it is a good idea to apply stain to any drill holes and upon completion of the installation any scratched or marked areas of timber should be touched up with stain. Don`t think that just because you have stained the gates they can now be forgotten about. Every 3-6 months they should be wiped down with a damp cloth to remove dirt and debris and every 12-18 months they should be retreated with the appropriate stain to help keep them well protected against the elements. Here are some examples of what can be achieved with a little effort. Here is an example of the Vertifleur Wooden Driveway Gates that have been properly stained, installed and maintained to keep them looking their best. These Salisbury Wooden Estate Gates have been well fitted to metal posts and feature a very light stain to all the surfaces. As a result they have created an great entrance to this property. This simply yet elegant Windsor wooden side gate hase been stained to a medium brown coloour whilst the infill panels has been carefully painted black. This example shows how not to finish your new gates. There are lots of run marks, uneven coverage and the back of the gate has not been stained. As you can see this has resulted in the gate twisting as it has been able to absorb and evaporate moisture at an uneven rate. 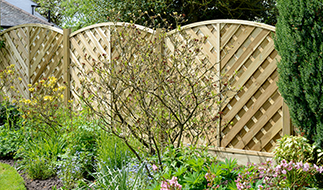 Our range of softwood gates are constructed using FSC certified Scandinavian Redwood and as such will have a number of visible knots in the timber and variations in the grain of the wood. In some instances they may also have resin streaks where the sap leaches out after felling. These are not faults and are simply part of the beauty of timber. If you want a uniform appearance don’t buy a wooden gate. Whilst hardwood gates will not have the same level of knots you should still expect to see variations in the timber grain structure. If you look at timber under a microscope its grain structure is a bit like hundreds of straws bound together. The basic principle is that these hollow sections soak up moisture sending it up the tree allowing it to grow. The drawback to this is that once the tree is felled the process does not halt. As a result of this in some instances the timber may start to show signs of mould which should be wiped off using a mild detergent so the problem does not progress into something that will severely effect the appearance of the gates. Whilst the timber used to construct a wooden gate is will always be from the same species it may not always come from the same part of the tree or even from the same tree itself. As such you should expect to see some difference in the grain structure, shade and colour. We always try to ensure any differences are kept to a minimum by selecting similar boards however we stand by the fact that this is part of the natural beauty and charm of a wooden gate. As a gate building material metal is an excellent product to work with as it can be shaped into numerous designs with ease. Furthermore because the steel is far harder than timber it will not dent, crack or split (unless applied with a great amount of force) making it the perfect material of choice for entrances that get a large amount of use. However before deciding on the suitability of this steel as the material of choice you might be interested to learn a little more. If you will not be installing your gate straight away we recommend that it be stored upright in clean and dry environment. It is important that the gate is not allowed to remain damp before painting as small rust marks may appear. Unless you have specifically ordered pre finished gates it is essential that they are painted with at least 2 coats of exterior grade paint prior to installing them so as to provide an adequate level of protection against the elements. This is because most designs only have a primer undercoat applied by the factory. Do not be fooled into thinking this is the finished surface as they will start to rust in a matter of weeks! (This is not a manufacturing fault and is your responsibility to complete). Once you have finished fitting your new metal gates it is recommended that you touch up any marks that may be present to maintain protection against rust. We also suggest that you paint the nuts, bolts and fixings at this point. To keep a metal gate looking its best we recommend that they be wiped down every 3-6 months with a mild detergent and soft cloth making sure you remove dirt and bird droppings as these can eat into the paint if allowed to sit for a prolonged period. Every 2 years (or sooner if the manufacturer recommends) apply a fresh coat of paint to the gate and it should last you a lifetime. Constructed from a natural material a timber gate will provide charm and character to any space. Timber offers a more traditional appearance than the starker lines of metal. It is possible to change the appearance of timber by applying various shades of stain to the surface. Due to the high strength properties of this material gates constructed from metal provide high levels of strength and rigidity. Metal is easily worked into a number of ornate shapes meaning the design possibilities of this material are pretty endless. Large openings can be spanned making metal the perfect material for the construction of large double drive gates. Steel is hard wearing and will require minimal amounts of maintenance. Please note that the installation and maintenance of your wooden gate is not our responsibility therefore should a problem arise as a result of poor fitting or regular ongoing care we will not be held liable.